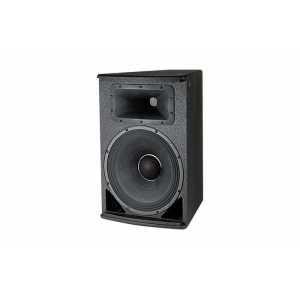 JBL AE Series - 2 Way Systems - Akwil Ltd.
AE Series - 2 Way Systems There are 24 products. AC2212 is a compact 2-way full range loudspeaker system comprised of one 12” low frequency driver and one 1.5” exit/ 1.75” voice-coil compression driver. 55Hz-17kHz ±3dB. Power ratings LF: 300W, HF, 50W (AES 2hr). Max SPL 126dB in passive mode, sensitivity 109dB (1W, 1m). 90° x 50° coverage. Compact PT™ waveguide. AC2212 is a compact 2-way full range loudspeaker system comprised of one 12” low frequency driver and one 1.5” exit/ 1.75” voice-coil compression driver. 55Hz-17kHz ±3dB. Power ratings LF: 300W, HF, 50W (AES 2hr). AC2212 is a compact 2-way full range loudspeaker system comprised of one 12” low frequency driver and one 1.5” exit/ 1.75” voice-coil compression driver. 55Hz-17kHz ±3dB. Power ratings LF: 300W, HF, 50W (AES 2hr). Max SPL 126dB in passive mode, sensitivity 109dB (1W, 1m). Compact 2-way full range loudspeaker system comprised of one 15” low frequency driver and one 1.5” exit/ 1.75” voice-coil compression driver. 50Hz- 17kHz ±3dB. LF: 275W, HF, 50W (AES 2hr). Max SPL 127dB in passive mode, sensitivity 97dB SPL (1W, 1m). Compact 2-way full range loudspeaker system comprised of one 15” low frequency driver and one 1.5” exit/ 1.75” voice-coil compression driver. 50Hz-17kHz ±3dB. LF: 275W, HF, 50W (AES 2hr). Max SPL 127dB in passive mode, sensitivity 97dB SPL (1W, 1m). Do you have a question about one or more of our AE Series - 2 Way Systems products? Click below to contact us.